J.W. Mann was born November 9, 1838 in Lebanon, Tennessee and like many Tennesseans, he moved from there to Waco in 1858. He sold horses to Wacoans until 1861 when he enlisted in the Confederate Army and served for the duration of the war as a scout and blacksmith under the command of fellow Waco 92 member Peter F. Ross. Mann returned to Waco after the War and started working as a brick-maker for local construction projects. He married Cemira Twaddle in 1868 before purchasing land on the east bank of the Brazos to build a home for his new bride and to be the location of an enormous brick kiln and brick-making company. Mann’s bricks were used in virtually all central Texas buildings for several years and in 1870, it was pink bricks made by Mann’s company using clay from the Brazos riverbank on his property that were used in the Suspension Bridge. Those bricks are still there but hard to see today because the towers were covered up by stucco in the 1970s. Mann had many other business interests as well including but not limited to: groceries, milling(as owner of a company called Brazos Mills), cotton production, oil, and mule-raising. Brazos Mills specialized in the mass production of flour and was said by 1878 to produce more flour than any other mill in Texas and at a quality unsurpassed in the United States. 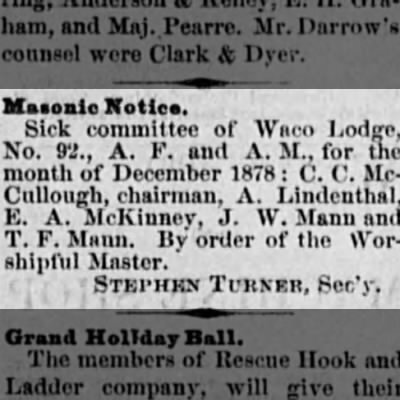 Brother Mann was also a board-member of the Waco, Belton, and Gatesville Turnpike Company with other 92 men such as John Napier, Sion Trice, John C. West, and Sid Olive. Its main purpose was the creation and maintenance of roads linking major central Texas cities for the first time in the 1870s and 1880s. Brother Mann owned a large building downtown known as the J.W. Mann Building and it was an economic and social hubbub of Waco for many years. Mann was perhaps best known in the arena of commerce as the long-time president of Waco National Bank. The home was finished in 1874 and gained notoriety for its beautiful Italian style. It was more popular then among Wacoans to aim for a Greek Revival style of architecture but while courting Cemira, Bro. Mann learned that she preferred Italianate style buildings because they reminded her of the homes along the river in New York from which her family had moved. It was with that in mind that Mann promised to build Cemira a riverside castle in the Italianate style if she would agree to marry him. Eventually, the home fell into some disrepair and exchanged ownership several times. At one point, a local construction company was using the home for equipment storage and there were large ramps going in and out of the building. It was in this condition that our own Roger Conger, other locals, and the Junior League of Waco combined forces to restore the home and preserve it for future generations. Today, it is one of the historic homes taken care of by the Historic Waco Foundation. Recently, representatives from that organization visited Waco 92’s 2016 Open House event and brought with them J.W. Mann’s masonic sword. The fraternal relic excited the curiosity of all the guests. It can be seen at the East Terrace House during their usual business hours. In fact, all of the homes maintained by the Historic Waco Foundation originally belonged to members of our lodge. 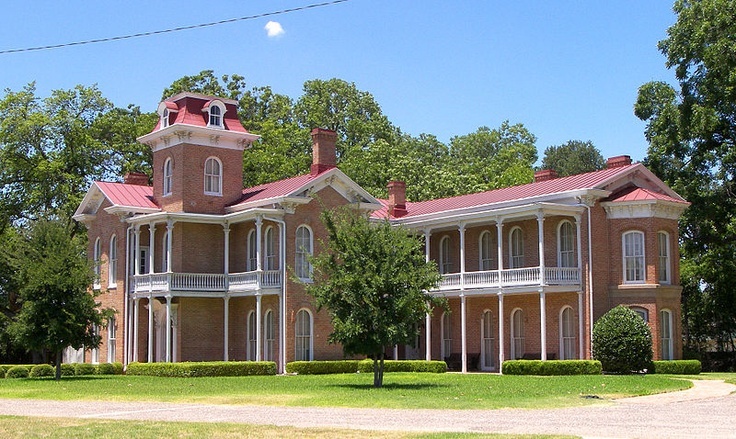 Click here and plan a visit to Waco’s historic homes. On June 1, 1883, local papers reported a massive fire on the Mann property in which his large cotton gin was lost. This was considered a major tragedy for the economy of Waco but he soon replaced it. Also during the 1880s, Brother Mann served with Waco 92 member William Fort(whose Fort House is also currently maintained by the Historic Waco Foundation) as directors of the Waco National Bank. When fellow Bank executive Brother W.B. Trice passed away, J.W. Mann was deeply affected and took up the task of executing the will for the family. In 1884, J.W. Mann provided Wacoans with $40,000 for the purpose of building a new bridge that could sustain vehicular traffic. This served as a major impetus to the Waco Bridge Company ultimately giving the Suspension Bridge over to the city for public use without the continued requirement of toll-keeping. One year later, Mann funded two-thirds of the expenses to add gutters and curbs to the roadway along Austin Avenue. In 1893, he was elected Mclennan County Treasurer. Also during the 1890s, Mann was known to travel frequently dring which he acquired real estate properties in many new towns such as Aransas Pass, Temple, and Lott. John Wesley Mann died in 1909 and the whole city of Waco mourned their loss. His gravemarker at Oakwood stands high above a cemetery that is filled with unique memorials.